History of Libya in the 20th century. For most of their history the peoples of Libya have been subjected to varying degrees of foreign control from Phoenicians, Carthaginians, Greeks, Romans, Vandals and Byzantines, right up to their last 20th century oppressor, the Italians, who occupied the country in 1911. 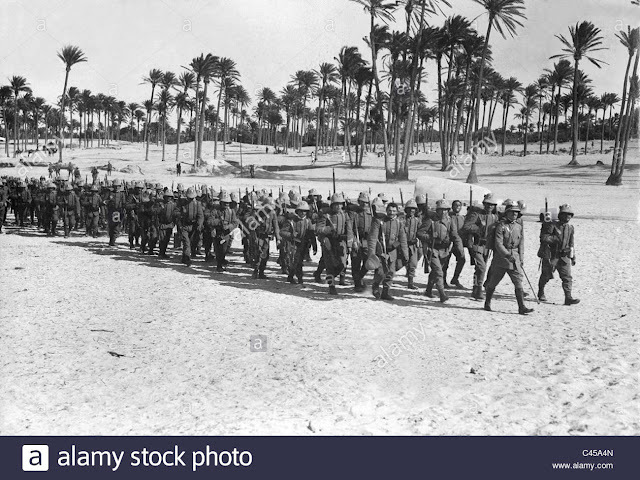 Italy attacked Tripoli, claiming it was a war of liberation against Ottoman rule when it was really an attempt to re-establish a Roman Empire in Africa. Despite a major revolt by the Arabs, the Ottoman Sultan ceded Libya to the Italians, leaving Tripoli largely under Italian control. In 1920 the Italian government recognized Sheikh Sidi Idris as the hereditary head of a nomadic tribe. Idris was then given the title of "Emir" by the British, eventually becoming King of the Free Libyan State. But after dictator Benito Mussolini came to power, fighting intensified. His appointee, General Badoglio, waged a ferocious pacification war and in 1922 Idris fled to Egypt. His [General Badoglio's] successor, General Graziani, was even worse, being given carte blanche by Mussolini to crush Libyan resistance. Unencumbered by either Italian or international law, Graziani enclosed a large slab of the desert with barbed wire, incarcerating the entire population in a huge concentration camp. More than 300,000 perished in the most appalling conditions. Allied forces kicked out the Italians in 1943 and in 1944 Idris returned from exile. Under the terms of the 1947 peace treaty, Italy relinquished all claims to Libya, and in November 1949 the UN General Assembly passed a resolution that Libya should become an independent state with King Idris, a close ally of Britain, representing Libya in all subsequent UN negotiations. On 24 December 1951 Libya declared its independence and became a constitutional and hereditary monarchy under Idris, the first country to achieve independence through the United Nations. Oil was discovered in 1959 and Libya--one of the world's poorest--became extremely rich, except the wealth was concentrated in the hands of the few. In typical colonial fashion, Idris wasted no time in handing over Libya's natural resources to his new European masters. Discontent grew throughout the Arab world, with increasing calls for a more unified Arab entity. In 1969, inspired by the example of Gamal Abdel Nasser in Egypt, Colonel Qaddafi and a small group of army officers staged a coup d'etat and kicked out the ailing Idris, who returned to Egypt. The new regime, headed by the Revolutionary Command Council (RCC), abolished the monarchy and proclaimed the new Libyan Arab Republic with the slogan "freedom, socialism and unity," with Qaddafi as its leader. The new rulers pledged to remedy backwardness, take an active role in the Palestinian and Arab cause and encourage domestic policies based on social justice, non-exploitation and an equitable distribution of wealth. One of their first acts was to close down British and US military bases, nationalize the oil and provide free healthcare and free education for the Libyan people, giving them the highest standard of living in Africa. In the 1970s Libya claimed leadership of Arab and African revolutionary forces and sought an active role in the international scene.